Le 15 Patisserie: Baking with Green Tea! If you follow the latest pastry trends in Paris, you can't miss the powdery green flakes seen in the vitrines of almost every famous patisserie. Little operas dressed up in green and white, macarons with a soft green center and pale green sables dipped in sparkling white sugar. “Matcha, pronounced as maht- cha, is a kind of powdered green tea used in the Japanese Tea Ceremony. All authentic Matcha only comes from Japan’’ says Amit Mehta, India’s first Tea Sommelier. I was first introduced to Matcha during my internship in Paris . My chef (like most French chefs I know) had a liking for all things Japanese. We were across the street from a Patisserie called Sadaharu Aoki (highly recommend!). This shop had the most mesmerizing spread of French style- Japanese flavored pastry. Whenever we had any occassion to celebrate we always got dessert from Aoki. A lot of people are addicted to drinking green tea (including me) and since I love experimenting with flavors, I asked Amit to help me understand how to work with matcha and to give you a recipe to try at home. • Matcha dissolves in water completely when well mixed and is the very reason for being adapted in a lot of dishes. • It gives a nutty, vegetal and sweet note without being bitter. • While choosing a Matcha as an ingredient for your recipe, it is important to note that a lighter green matcha is on the sweeter side and the darker ones are more astringent. Choose one depending on what you’re baking. • It is the healthiest of all green teas; since the leaf is consumed in its entirety it has more nutrients and vitamins. 1. Cream butter in a bowl. 2. Add sugar in the butter and mix well until light and fluffy. 3. Gradually add beaten eggs and whisk well. 4. Sift flour, baking powder, and green tea powder together and add the flour to the egg mixture. 5. Pour the batter into a buttered loaf pan. Chado Tea is an American Tea Room company and is represented in India by Amit Mehta who is also incidentally “India’s First Certified Tea Sommelier and Organoleptic Analyst” and is in the Business of Export of Premium Darjeeling, Nilgiri & Assam Teas and Imports one of the finest Teas, Herbals and Tisanes’ from Japan, China, South Africa, Argentina and Taiwan. Chado Tea boasts of the largest sourcing in the world of Teas and a range of accessories to make that perfect cup. So where do we get Matcha in Mumbai? 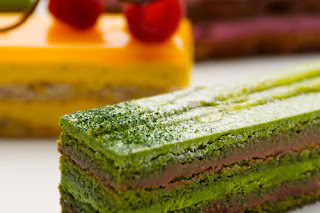 Nice looking green tea mille-feuille there! When are you guys going to introduce this addictive sweet? Wow...this green tea pound cake looks so yummy....when are you ging to serve this at chado tea? Wow I didn't know that baking bit about Matcha - but well, Thanks to Amit and CHADO i have drunk the tea. I would highly recommend it to all Green Tea lovers. Hey this recipe sounds super interesting. Could you suggest a substitute for eggs? is there a substitute for eggs!